Lacu Roşu, health and holiday resort in Harghita county, Romania. It is a climatic resort situated 28 kilometres from its magisterial centre Gheorgheni, in the valley of the Bicajel creek, between the Suhardul Mic, Suhardul Mare and the Ucigaşul mountain. The main sight of the resort is the Red Lake, of which pinewood stumps stick out. Its name comes from the name of the Ucigaşul mountain (Killer mountain), which rises above it, and maybe refers to a murder, or it may refer to the dangerous paths, which lead to the mountain. Its romanian name Lacu Roşu (Reddish lake) comes from the reddish alluvia deposited in the lake by its main tributary-Pîrîul Roşu (Red Creek). The lake was formed by a rock slide, as a rockfall closed the way of the Bicajel and Roşu creeks. 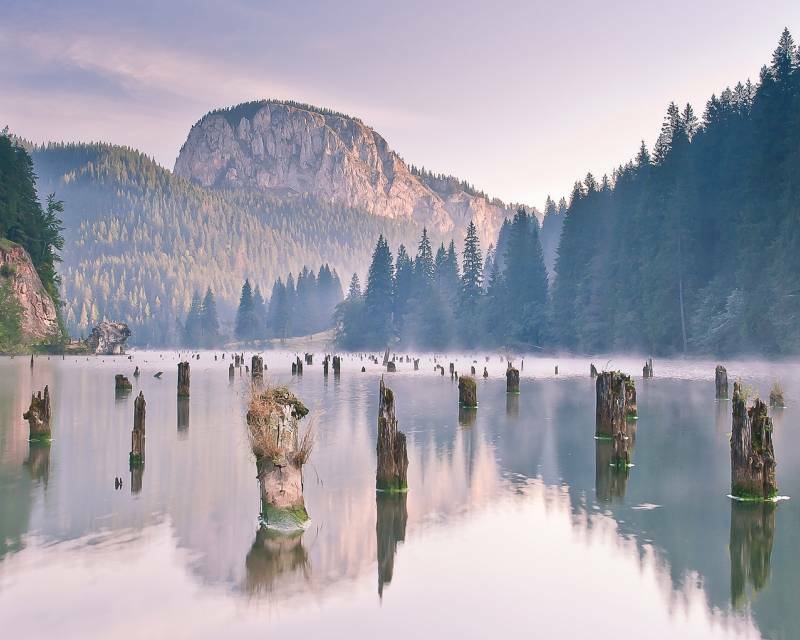 The lake lies at 983 m altitude, its maximum depth is 10 m. It is one of the most picturesque lake of the Carpathians, which is surrounded by high cliffs (1000 m).